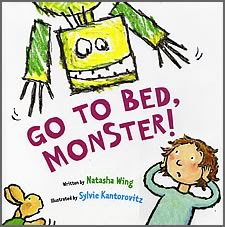 Crazy For Kids Books: Cybils Finalist: Go to Bed, Monster! Cybils Finalist: Go to Bed, Monster! Natasha Wing and Sylvie Kantorovitz have created a terrific bedtime story that will resonate with parents and kids alike. A very unsleepy Lucy gets out her crayons one evening and crayons herself into a series of adventures with a new friend named Monster. The two of them build castles and fly airplanes and march in a parade together until Lucy is tired and ready for sleep. But, Monster isn't. Then the recognizable list of bedtime needs and complaints begins as Lucy takes on the parental role of putting Monster to bed and getting him to sleep. This role reversal will amuse children and parents both.Part of the charm of this story is the lean elegance of the text and illustrations. They effectively convey the power of a child's imagination while demonstrating to children the universality of bedtime games and the struggles parents have in getting their children to bed and to sleep. Congratulations to Natasha and Sylvie on becoming a Cybils’ Award Finalist. I highly recommend this story for children ages 4-6. Check out more blogger reviews for Go to Bed, Monster! at Seven Impossible Things Before Breakfast, Cheryl Rainfield's Book Blog, and World of Words. ALSO check out this interview with Natasha Wing and Syvlie Kantorovitz at Becky's Book Reviews. Welcoming 2008 with Cybils Award Finalists!